Being published by a prestigious literary journal such as Australia’s Overland is a humbling experience. Established in 1954, the journal’s mission is “to foster new, original and progressive work exploring the relationship between politics and culture, especially literature, and to bring that work to as many people as possible”. My piece “Sites of Belonging” explores the nature of identity as a construct — product of a long process of sense-making — in the context of the recent Best American Poetry controversy. In this article, I argue that identity is flexible and ever-changing, its construction and expression depending on the political, economic, social and cultural circumstances in which people of diverse backgrounds interact with each other. However, identity as an imagined “site” appears to have a remarkable bounding power over those individuals and communities who define themselves as belonging within and outside of it. As a result, when they feel the boundaries of such a “site” are under threat, they can react in the same way that citizens of any nation does when its geo-political borders are breached. This is demonstrated in the case of The Best American Poetry 2015, whose guest editor Sherman Alexie selected a poem by “Yi-Fen Chou” who turned out to be Michael Derrick Hudson, a white poet using a Chinese pen name to boost his chance of being published by an industry struggling to embrace “political correctness”. A huge number of writers of colour — white writers included — participated in subsequent (and often fierce) discussions and debates on issues such as “cultural in appropriation”, “yellowface” and “colonial theft”. While diversity in literature is a universally desired goal, I caution that identity is not and should never be considered to be real. Instead, it is only “an intellectual, emotional and psychological construct that is deliberately established and continuously standardised and circulated for the purpose of distinguishing one from another”. 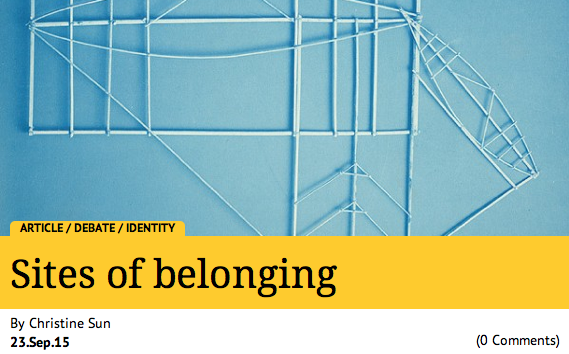 I hope you enjoy my piece “Sites of Belonging”. It can be viewed HERE.